If you’ve listened to our interview on KIIS FM, or followed our Instagram page, then you already know about Justin, from Los Angeles, California. Better known for his Instagram handle, @justinsfrogproject, Justin launched a sustainability initiative ‘For the Love of Frogs,’ which quickly evolved into a journey deeply rooted in friendship and family. When Justin first learned that frogs were an indicator species, he resolved to do everything in his power to help his amphibian friends. Justin learned that an indicator species is one which tells us about the impact of pollution on an ecosystem. A declining frog population is trying to tell us that our planet needs our help. Justin started learning more about the problems with plastic pollution. He discovered ways to keep trash out of landfills. He switched to reusable snack bags and gave lessons on composting at Emerson Gardens. He also learned how to recycle crayons, turn fishing line into bracelets, and transform plastic bags into doormats. Then he came across a little girl that melts 200 pounds of plastic bottle caps into a buddy bench that encourages kindness and new friendships. In the summer of 2018, Justin wrote a letter to Sammie to learn more about her Buddy Benches. He learned that a Buddy Bench is a place where students can go at recess when they are feeling lonely, upset, or want to make new friends. Justin was beyond excited about the concept and the two of them quickly became pen pals and began writing letters weekly to each other. And within weeks, Justin wanted to make a Buddy Bench for his school in Los Angeles. He started collecting bottle caps from friends, neighbors, his classmates, the YMCA, Walgreens, and packages even started arriving from multiple states and the furthest package came all the way from Norway. In January of 2019, Justin and his family joined Grades of Green at a Los Angeles Kings game, where the dedicated Staples Center staff took the group on a tour of the remarkably sustainable stadium. After speaking with Sustainability Manager Jessica Franco, the Staples Center promised to make his bottle cap dreams come true. Just a few weeks later, they did exactly that. Arriving at Justin’s home in Los Angeles with hundreds of pounds of bottle caps, the Staples Center helped him reach his goal of 210 pounds of plastic bottle caps. With that, Justin and his family were off to meet Sammie in Indiana and deliver the caps to be melted down. Justin’s family and friends worked tirelessly to help him achieve this awesome feat, first by scouring Los Angeles for bottle caps, and then zig-zagging across the country to complete their mission. What began as a sustainability initiative, grew into a lasting friendship and a bonding experience for the whole family. 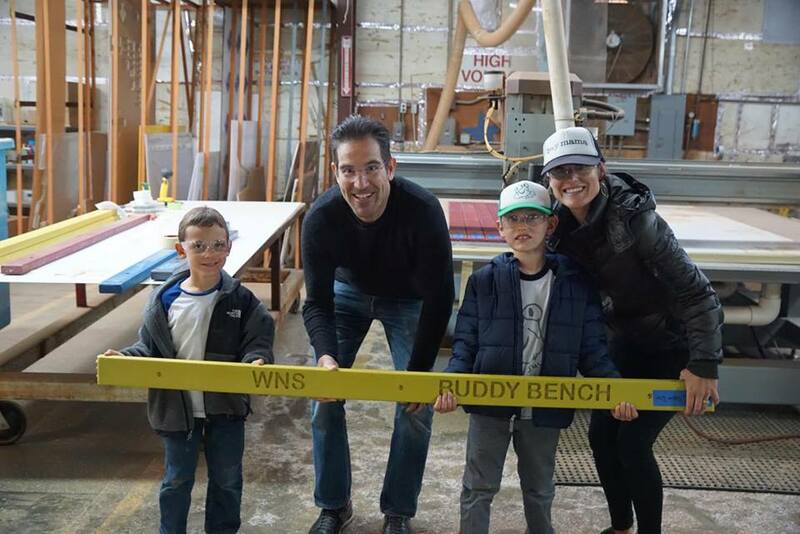 Last month Justin’s Frog Project held the first board of his Los Angeles Buddy Bench, with family and friends in attendance. Check out our Instagram to see photos from Justin’s journey and his meeting with Sammie! You can also follow Justin and Sammie's adventure by following @powerofpenpals on Instagram.